The Venn diagram is a map of my research at the current time. Energy and electrocatalysis are at the center and various things evolve from there. Largely, we focus on unusual ways to electrocatalyze reactions that are important in energy generation and storage. The unusual means of electrocatalysis include: introduction of micromagnets on the electrode to increase rates of electron transfer; use of ultrasound in a thin layer to activate the electrode surface; and modification of electrodes with algae to make ammonia. 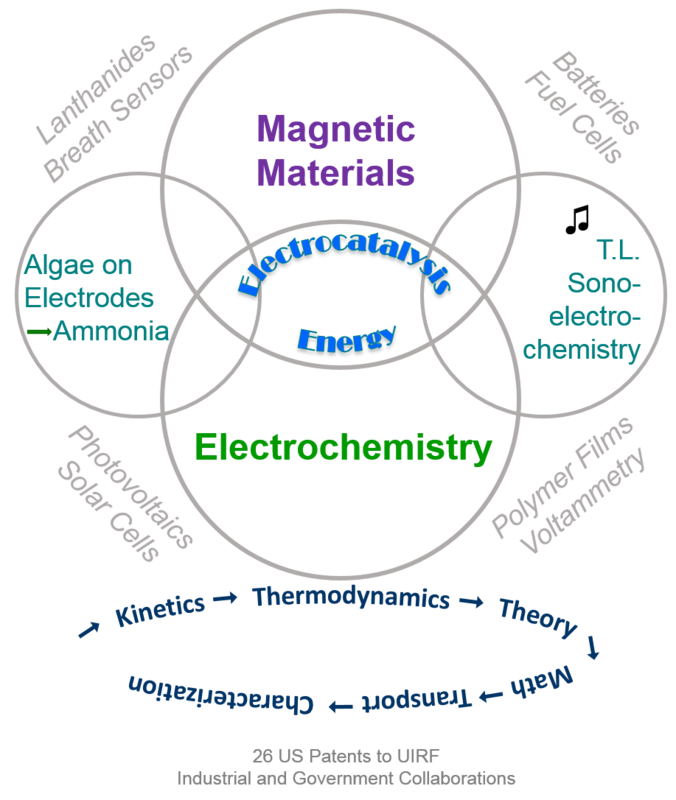 At the edges of the Venn diagram are places where these fundamental studies are implemented in energy technologies and voltammetric analysis. The bottom ring is a list of the tools that we use. It all ties together: theory and fundamentals to experiments to devices and back to theory. Experiments inform theory and devices, that lead to questions that generate more experiments. Photographs of Blaberus discoidalis (A), the transmitter circuit (B) and of a quarter coin (C) to compare the scales involved. While browsing through the vast array of Open Access articles that ECS hosts in its Digital Library, one title in particular caught our eye here at headquarters. The article, published in the Journal of The Electrochemical Society by researchers from Case Western Reserve University (one of the authors is ECS Board of Directors Senior VP Dan Scherson), details – to put it simply – how a cyborg cockroach can generate and transmit signals wirelessly.